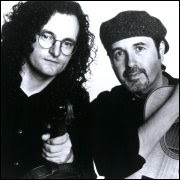 Friday, September 26, 2008, Flagstaff audiences will once again be amazed by the Irish music duo, Martin Hayes and Dennis Cahill. They have come through Flagstaff twice before and the people loved them! Martin Hayes has been an All-Ireland Fiddle Champion six times over, has taken home a National Entertainment Award (like an Irish Grammy) and was named Folk Instrumentalist of the Year in 1999 by the BBC Radio Awards. His fiddling is representative of his native East Clare style, slow and lyrical. But don't let that fool you, he is sure to have you out of your seat at least once during the show! Dennis Cahill is a native of Chicago, born to parents from County Kerry. He is as well-versed in classical, blues, and jazz, as he is in traditional music. His innovative accompaniment has been acknowledged as a major breakthrough for guitar in Irish traditional music. Don't miss this concert of traditional Irish music with subtle infunsions of classical, jazz, and blues! Martin Hayes & Dennis Cahill will perform Friday, September 26, 2008 at 8:00pm at the Cline Library Auditorium on NAU's Campus. Tickets are $25 with a $2 discount to members of NACHS, FFOTM, Seniors, NAU/CCC Faculty and staff. Student and Child tickets are only $15! Tickets are available at NAU Central Ticketing, Cedar Music, and www.ticketmaster.com. For more information, email Kari@LivingTraditionsPresentations.com or call 928-600-1365.